2. The Osages Enter Kansas. 14. Citizen Lawmen - The A.H.T.A. A Year and a Day — Passionist Memories. St. Paul - 1890's as a Scale Model. St. Paul, Kansas — 135 Years Ago. Actually, we were not St. Paul yet. Father John Schoenmakers’ new town was still named Osage Mission. Our population was near its peak — and no one was a long-term resident. A very diverse group of people were working together to build a prosperous and pleasant community. Our business district expanded to several streets … But, changes were ahead. The Grist Mill Sat Just East of the Baseball - Track Field on the West Bank of Flat Rock Creek. No one had been here long. At that time the population of Osage Mission was about 1,400 . Many of us had relocated from Kentucky, Pennsylvania, New York and other eastern locations hoping for a better life in the free state of Kansas. Many were immigrants. Among the settlers were Civil War Union veterans taking advantage of the veteran benefits from the Homestead Act. Some of those families are still here. However, some probably came here as builders, completed their work, and then left. We were about as diverse as we could be but we were determined to do well together. Here is a snapshot of what the main business area of Osage Mission looked like in the early 1880’s. The illustration is a March, 1885, Sanborn Fire Insurance Map . The list of businesses is from the January 4, 1882 Neosho County Journal. The list of “Other Business Entities” is of businesses on file (but inactive) with the Kansas Secretary of State Office. 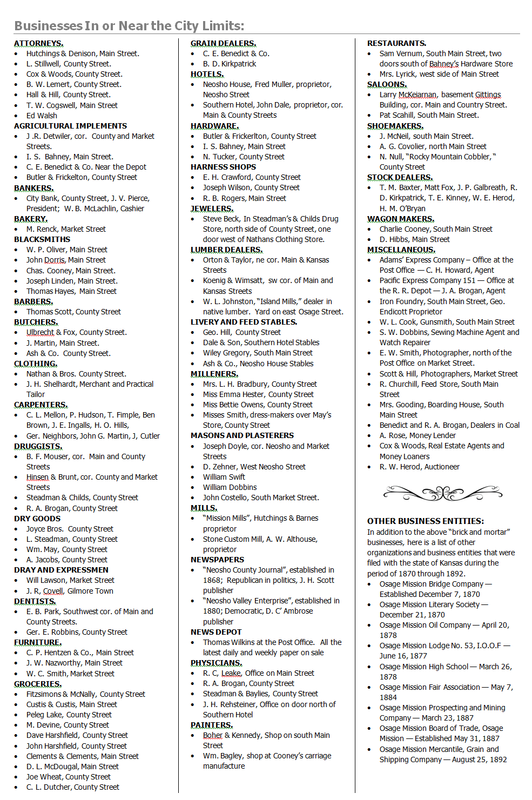 There were probably more businesses during the early 1800's, but these are the ones listed in the newspaper article and in the current Kansas Secretary of State Business Entity Database under search key “Osage Mission.” By now it should be clear that our town was a pretty dynamic small community. We had a team of newcomers who were determined to work together and shape Osage Mission into a successful enterprise. They did it well! “Boom” is a sudden event. The first fifteen years of our existence saw a huge surge in construction; some of which was unusual for frontier startups. In addition to businesses, homes and public schools; the Jesuits and Loretto’s built two large boarding schools. St. Ann’s Academy alone consisted of several large stone buildings. St. Francis Institute, plus the original Jesuit monastery, also featured imposing stone and frame structures. Those buildings required the services of specialized builders and much of the work was finished by 1880. When you look at the number of carpenters, masons and plasterers above, it is not hard to imagine that many specialized tradesmen had already left. More would leave when the large stone church was dedicated in 1884. Follow THIS LINK for information about construction of our Catholic Church and subsequent upgrades. Building Materials Were in Demand! ​A Come & Go Effect. As noted earlier, Osage Mission was very close to the Missouri state line. Many of the settlers stopped here first because we offered good schools and some security. We know quite a few moved on later. During the period of 2009 through 2012 alone I am aware of people from Canada, California and New York who visited the local museum with the purpose of doing family research. Their ancestors had been here for a while and then relocated. Loss of the Jesuit and Loretto Presence and Schools. 1890 to 1895 was a painful transition period. The Jesuits closed St. Francis Institute in 1891, and left the following year. In September of 1895, St. Ann’s was destroyed by fire and the Loretto’s left shortly afterwards. In July of ’95 a very controversial name change — Osage Mission to St. Paul — became effective. The loss of the schools and staff had a negative impact on the local economy and population. Some people might have been disgruntled. Follow THIS LINK for more information. The Arrival of the Passionist Order. ​The decision, by the Passionists, to establish a presence in St. Paul undoubtedly caused a local sigh of relief. But the full effect of the Passionist presence would not be felt until after 1900. As noted, that is beyond the scope of this page. However, some links to the Passionist story are HERE & HERE. There are probably other factors and we would be interested in opinions. 1. The timing information for this article is from three sources: 1) An article from the January 4, 1882 Neosho County Journal; 2) The banner photo is believed to have been taken in 1884; 3) The Sanborn Map is from March of 1885. For simplicity we rounded to 1883. Background information comes from several sources, and many are listed in the "Some Reference Information" sections at the bottom of pages linked herein. 2. For more information about the founding of Father Schoenmakers “mission town” follow THIS LINK. It is also noted that the Jesuits and Lorettos started the original Catholic Osage Mission, as a government facility, twenty-one years before the town company was formed. 3. The 1880 government census for Osage Mission was 1,306, up from the initial 1870 population of 791. The largest county number for our town that I have found was 1,440 reported in the May 10, 1882, issue of the Neosho County Journal. The 1890 government figure was 1,097. 4. When Father Schoenmakers founded his “mission town” he called it Osage Mission, in recognition of the government “Catholic Osage Mission” that the Jesuits and Loretto’s ran for several years. During the early 1880’s some local businessmen began a campaign to rename the town. They didn’t believe the original name represented a vibrant, business community. On July 1, 1895, the decision to change the name to St. Paul was formalized but it was very controversial. Follow THIS LINK for more information about a tumultuous period of transition. The banner photo and Flat Rock Mill photo were scanned from photos on file with the Osage Mission - Neosho County Historical Society. 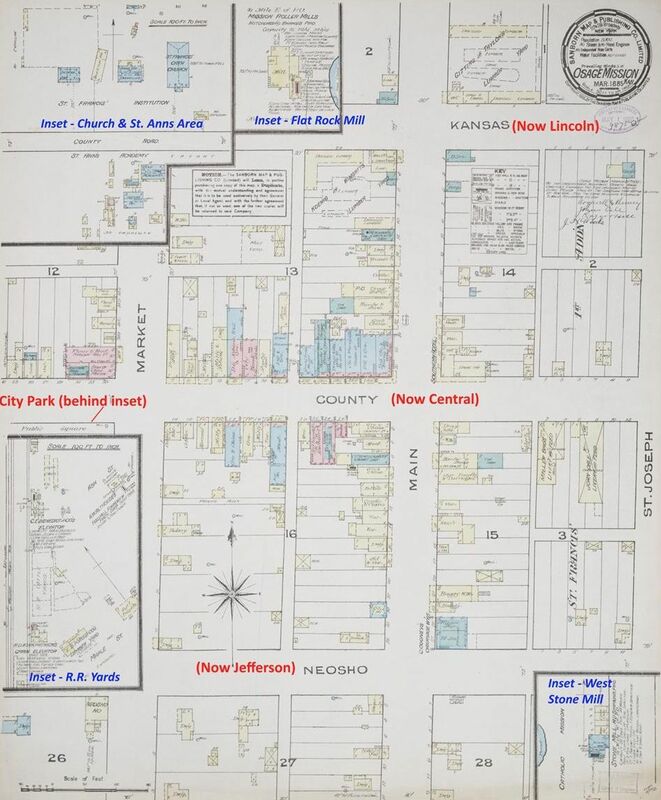 The 1885 Sanborn Map is an edited digital image. This image was obtained from the The Kansas Collection, Kenneth Spencer Library, University of Kansas. The list of businesses is a JPG conversion from a Microsoft Word file done by the webpage editors. The illustration of St. Francis Catholic Church, under construction, is photo-edited from a historical photo on file with the Osage Mission - Neosho County Historical Society. Editing by the webpage editor. The "To Brickmakers!" 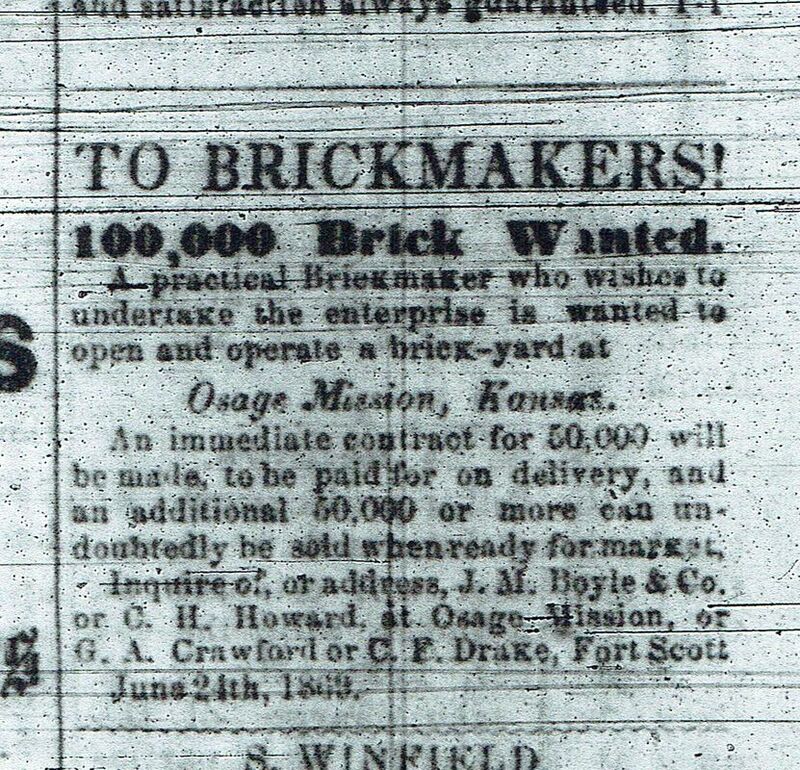 advertisement was scanned from a microfilm copy of the September 23, 1869 issue of the Osage Mission Journal. Below is a recent Google Earth image of the area shown in the Sanborn Map. Note that the street nearest the bottom is labeled as both "Jefferson" and "Center." Jefferson is correct. acatholicmission.org is a privately hosted website. We hope that our site will educate and entertain those who are interested in the fascinating Osage Mission - St. Paul - Neosho County Kansas story. Ours is a regional story that crosses state lines, ethnic groups, faiths and a variety of frontier and post-frontier interests. Enjoy.